Or, in English: Please meet The Lumiere and The Elyse! They are very French. Very Parisian boudoir. Very French chic. Very French country chic. Very French Provincial. When I acquired these pieces, they had that very drab and very dated creme yellow enamel finish thing going on (see below). It HAD to go. 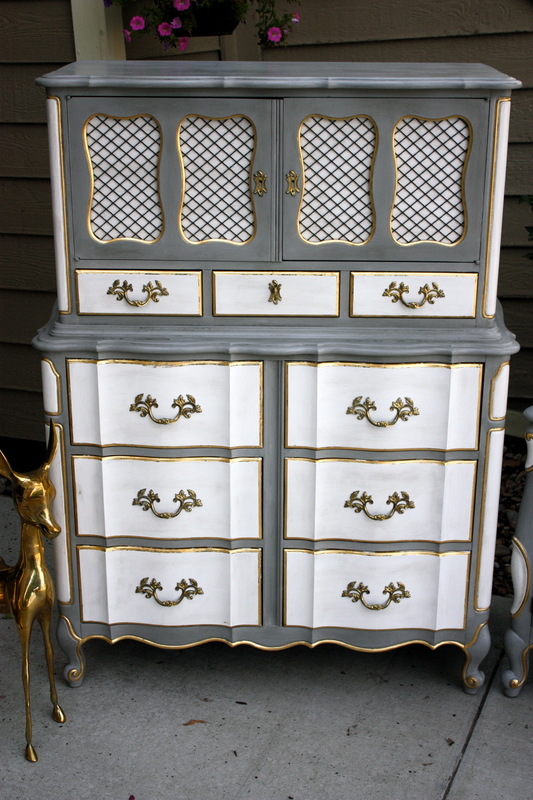 Good thing they found their way to my workshop…seeing as re-imagining old, drab, dated pieces is what I do. Now, if you’ve been following Urban DEN for a while, you know, or have figured it out, that I don’t really do neutral. I mean, I do neutral sometimes. As with everything I do, I let the piece tell me what it wants…what color, what finish, what overall aesthetic. I don’t really go in with a plan; as I’m prepping and cleaning a piece, I let my hands and my intuition do the talking and go from there. Sometimes that “vibe” I get from the piece matches the idea I formulated in my head the minute I brought the piece back to the workshop, but more often than not, it doesn’t. Well, with this set, the idea in my head was the exact “vibe” I tuned into while prepping these beautiful, majestic pieces. That vibe was Paris Gray and French Linen. And GILDING! Look at all that GILDING! 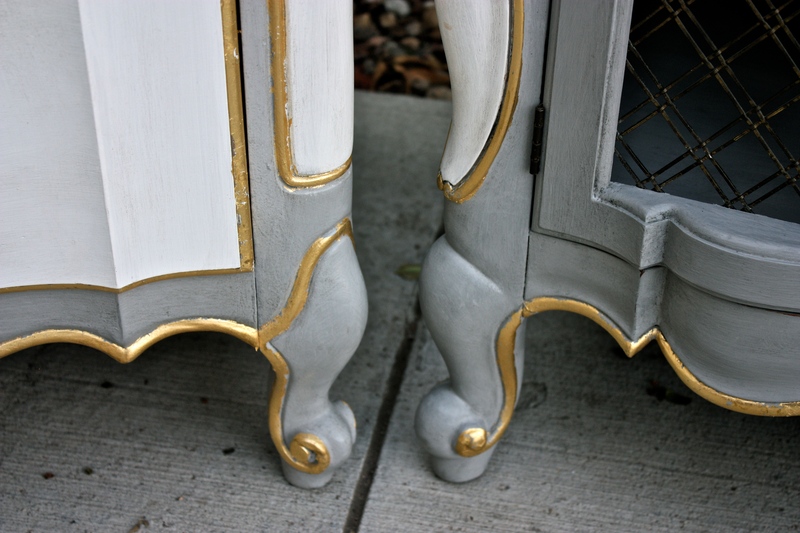 These two pieces had such beautiful French Provincial detailing…the swooping aprons, the scrolled feet, the curvy insets…all just begging to be gilded with luscious gold leaf. I hand-laid gold leaf over every bit of it, too. Hours upon hours upon hours of meticulous, steady-handed gilding and burnishing. And it was worth every minute of it. 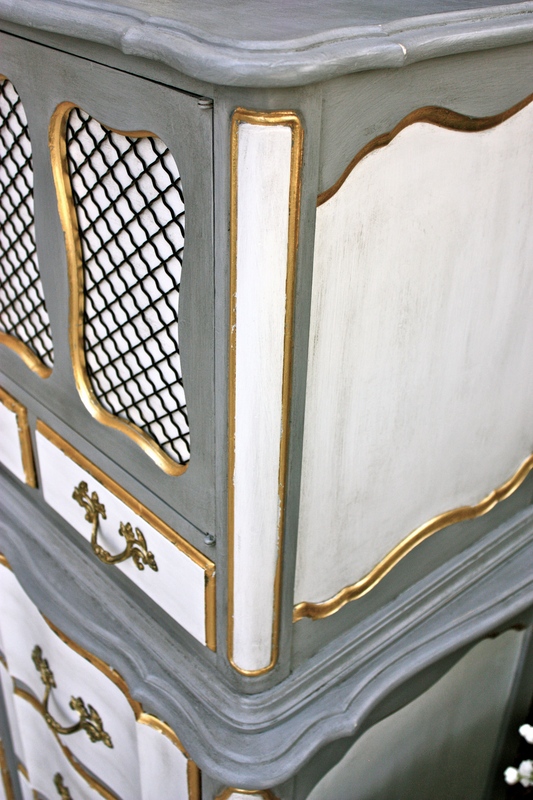 The gold leaf gilding is just stunning! It’s amazing how much better real gold leaf looks compared to gold tinted gilding waxes. It’s so gold and imperfect and authentic. Look how the gold leaf pops on the details. Another close look at the gold leafing. 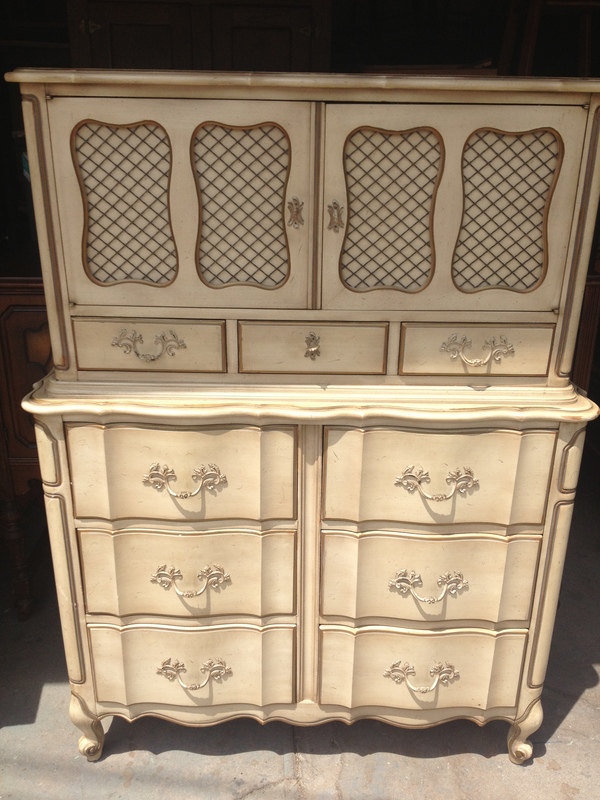 Look at the wonderful curves of the nightstand! 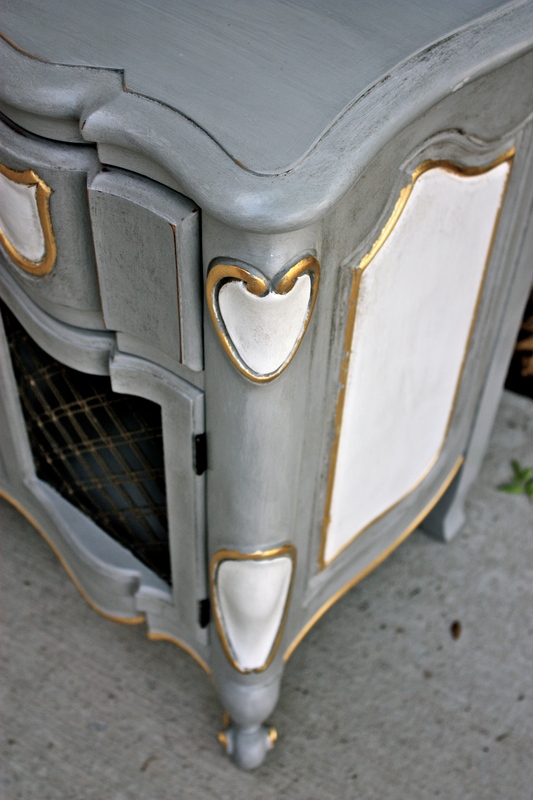 As you can see, the nightstand and chest-on-chest aren’t an exact pair. 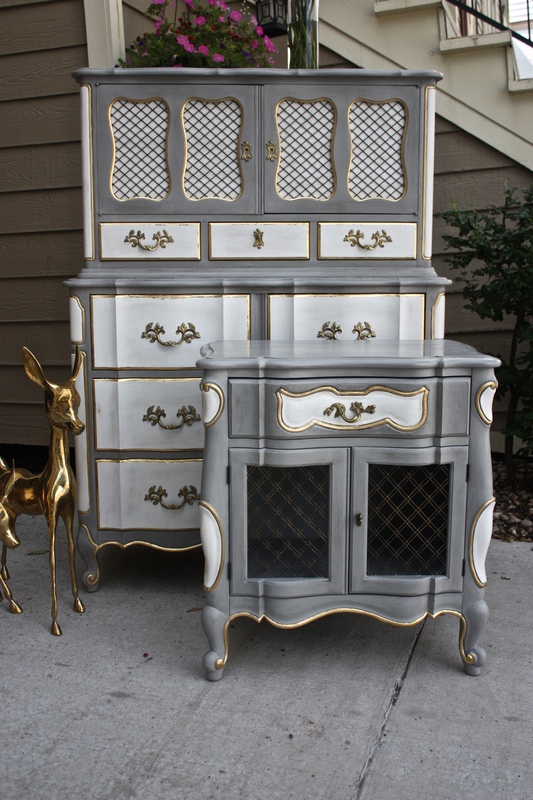 They are both classic French Provincial style but the nightstand has more Bombay influences mixed in. 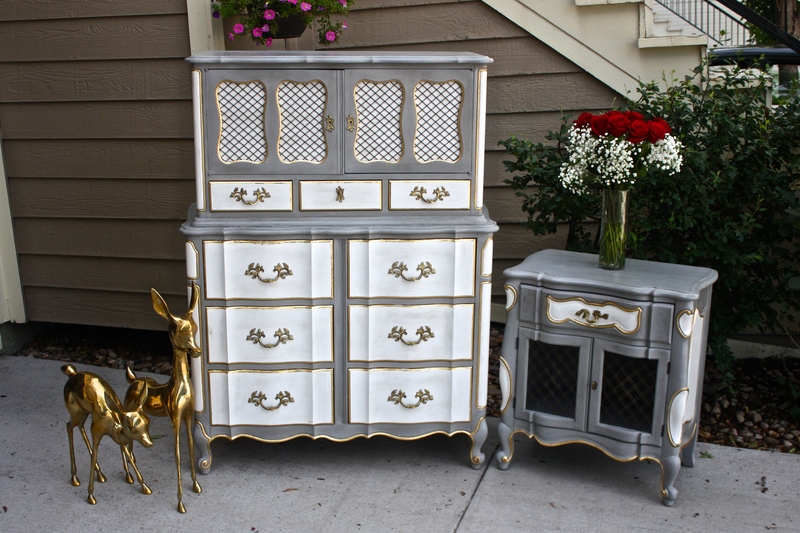 With the gorgeous new Paris Gray & French Linen two-tone finish, though, they are a perfect match! What do you think? Do you love it? I know that I do! I may not do neutral very often, but when I do, and it comes out looking like this, I get very, very tempted to do more and more neutral finishes! If done right, even neutral beauties can be absolute show-stoppers. These beauties are offered for sale as a set. You can find them over in the Etsy shop. Thanks for stopping by!